I’ve been meditating for years now, but the same thought flashes through my mind every morning when my alarm sings its pleasant little riff at 5:30 am: Meditation is stupid. Sleep is better. But I get up and do it anyway, because my first thought of the day is always wrong. Meditation is not stupid. Meditation pieced me back together when I felt broken. It Tetris-ed me back into being. That’s why I do it pretty much every day. I put on my husband’s sweatshirt in the dark and stumble down the hall, flip on the twinkly lights and stretch, feeling a gentle resistance from my joints as they slowly wake up. I sit on a cushion and do absolutely nothing, except this really, really hard work. The word for meditation in Tibetan is translated as “getting used to it.” It’s not easy to step back from our overly-stimulated lives and focus on the breath. In fact, one study gave participants the option of sitting quietly for 15 minutes with their own thoughts or giving themselves a mild electric shock; 67 percent of men and 25 percent of women chose to push the button and get a shock. We are so uncomfortable just being still, we’d prefer to be distracted by just about anything. Even self-inflicted pain. But people who practice meditation decide it’s worth it to do the difficult thing. We decide to pay attention and notice our emotions without acting on them. We refocus away from the self-indulgent doom-spiral habit of our minds. Meditation is the equivalent of deciding to stop eating the entire bag of Goldfish crackers, even if we’ve eaten most of them and there are only about fourteen left. With meditation, we take back control over ourselves. I tried that meditation thing a couple of times, it’s impossible and/or boring. I’ve never tried it, but it is totally not going to do anything to help these overwhelming emotions of mine. It’s so wimpy and passive, and hippies smell weird. I wonder if she is going to talk about movies anymore? Yes, this is totally the thing that is going to make everything better. Just for a while, please let go of all the preconceived notions you might have about what it means to meditate, because those are just going to get in the way. Meditation simply means paying attention on purpose to this moment right here, not judging it and not getting caught up in a million thoughts about it. In short, meditation is how I practice the habit of calming down. Meditation is not a belief system. No one is asking you to leave coins at the foot of a multi-armed deity if that’s not your thing. It’s just about strengthening your focus and concentration. A form of meditation called Mindfulness-Based Stress Reduction (MBSR) is now offered in 700 different medical centers to help patients and health care providers deal with pain and suffering. It can help people regulate the pain response, and can lessen the need for narcotic painkillers even after severe back surgeries. Meditation requires turning toward something we want to avoid: our own minds. It is incredibly brave. But there seems to be some resistance to the mere idea of meditation. People think it’s passive or Bohemian woo-woo stuff. They say they don’t have time; I say if you can’t find two minutes per day, you should probably take a look at your life because that’s an issue right there. I’ve heard the problem is finding the discipline to meditate, which is understandable. But for me, the willpower came when I saw my life improve significantly as a direct result of this practice. It became a no-brainer. But the biggest misconception pop culture promotes about meditation is that the goal is to think of nothing. People tell me all the time that their brain, being a particularly high-strung and manic brain, will never allow it. No offense intended here, because I’m sure you are an absolutely lovely human being—but your brain is not special. Everyone’s mind has a bajillion thoughts a minute, because that’s the job of the mind. It has kept us alive by constantly scanning the environment to come up with potential problems and threats. The heart beats, the mind thinks. If either of those things stop, we’re in serious trouble. We’re not trying to stop our thoughts; we’re just attempting to shift our relationship with them. We’re learning to take those unhelpful, repetitive, problem-seeking thoughts less seriously. We want to have this nice, fun, casual dating thing going on with our thoughts. Thoughts are great, they’re useful, but we don’t need to get super attached to them all the time. The problem for many of us is that we’re in this dependent, clingy relationship with our mind, where thoughts are obsessing every moment of life and blowing up our phone with needy texts. We’re training ourselves to use our minds effectively. You don’t have to be so locked into the present moment that you never plan for the future. Reminiscing about high school is totally okay, too. We’re just trying to become aware of what is happening in our minds, so our planning and reminiscing is more intentional and useful. We’re also attempting to put space between a thought bubbling up in our head and our reaction to it. That way, our thoughts aren’t stuck on some helpless, repetitive loop, where we replay our mistakes or lie awake all night catastrophizing everything that could possibly go wrong next week. It’s easy to make meditation goal-oriented, and think that we’ve failed if our mind wanders. But if your mind wanders and you notice it—that’s actually the whole point. That’s the key moment of the practice, when you transform from someone just sitting quietly to someone meditating. We’ll get into specific instructions for meditation soon, but the bottom line is, it’s that easy and that hard. You just sit with your mind and notice it thinking. With no judgment. Meditation is one thing in life that is not about achieving something. The only thing you are trying to do is not get pissed off when you notice your thoughts completely bouncing off the walls. That’s your only job. Don’t get upset when your mind runs off like a Great Dane puppy every 12 seconds. Just bring that puppy back. With kindness. With love. With no harsh lectures. (Have you ever tried lecturing a puppy? Those cute, dopey puppy eyes just look lovingly back at you. It’s pointless). The problem is never the puppy acting like a puppy. It’s how we react to the puppy that makes the difference. Every time you notice and bring yourself back to the present moment is a fresh start. As long as you’re alive, you get to start over. Every day. Multiple times during the day, even. Every new breath is a do-over. You can’t fail at meditation as long as you are being kind to yourself and aware of your experience—whatever it is. If you can sit with yourself for half a second longer than you did yesterday, you are a super star. You win at meditating. Pick up your ribbon at the door. 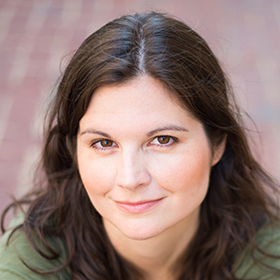 Read more articles by Lisa Jakub on her blog.